Vail’s Lindsey Vonn looks to be back in mid-season form Wednesday after turning in the fastest downhill training time on a World Cup course in Cortina, Italy, where she’s won 11 time in the past — or 14 percent of her overall women’s record 78 victories. Five of those wins have come in downhill (six in super-G), and her comfort level once again looked high as she glided to a nearly one-second advantage over the red-hot Italian racer Sofia Goggia, who’s coming off a win last weekend on a brutal course at Bad Kleinkirchheim, Austria, where Vonn took it easy to avoid injury ahead of the Olympics. Two other Americans, Jacqueline Wiles (third) and Alice McKennis (fourth), joined Vonn and Goggia in the top four in training. EagleVail’s Mikaela Shiffrin, who took last weekend off to train but has been sizzling hot of late with five straight World Cup wins to start 2018, turned in a respectable training result in 13th — more than three seconds off Vonn’s pace. Still, Shiffrin has won more downhills than Vonn so far this season, claiming her first ever DH win at Lake Louise in early December. 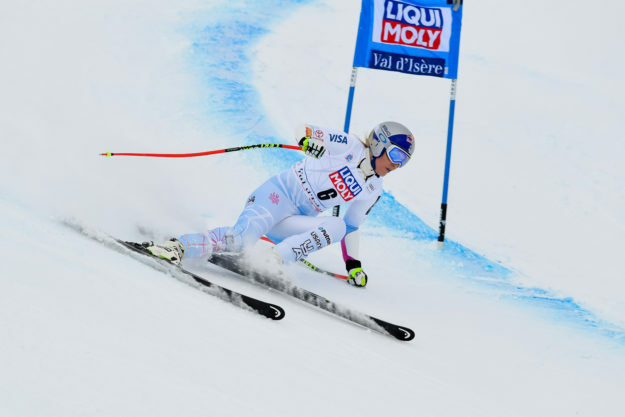 Vonn’s only victory so far this season was a December super-G win at Val d’Isere, France. Vonn, 33, has been battling back issues and a sore knee and is staying focused on next month’s Winter Olympics in Pyeongchang, South Korea, after missing the Sochi Winter Olympics in 2014 due to injury. Vonn last won a downhill at Cortina in January of 2016 when she set the all-time downhill victory record of 37. Goggia this weekend will be looking to thrill home-snow fans and set the tone for next month’s Winter Games, where she edged Vonn twice in downhill and super-G test events in March. The third-place finisher in both those speed events, Slovenia’s Ilka Stuhec, who chased Shiffrin for the overall title relentlessly last season, won’t be racing in Cortina or Pyeongchang due to injury. Shiffrin, 22, was a surprise fourth in last season’s super-G at Cortina — a race won by Switzerland’s Lara Gut, who was well off the pace in training on Wednesday. For the U.S. team, the jockeying for Olympic speed-event slots (each country gets four) has begun in earnest. While Shiffrin is a dominant tech-event racer (slalom and giant slalom), her downhill win at Lake Louise and 10 victories so far this season make her a hard-charging contender to take a speed-event position or two at Pyeongchang. Of her 10 wins this season, seven have come in slalom, two in GS and that one downhill. The defending slalom gold medalist from Sochi has boasted she wants to compete for gold medals in five events in South Korea. The most ever won at one Olympics in alpine skiing is three, and only one American has ever won two gold medals in the Olympics ever — Park City’s Ted Ligety in 2006 and 2014. The women race two downhills (one a makeup for a cancelled event earlier this season) and a super-G this weekend. The men this weekend take on the famed Hahnenkamm course at Kitzbuehel, Austria — the Super Bowl of ski racing.